Linking your domain name from GoDaddy to Vend Ecommerce – How can we help? 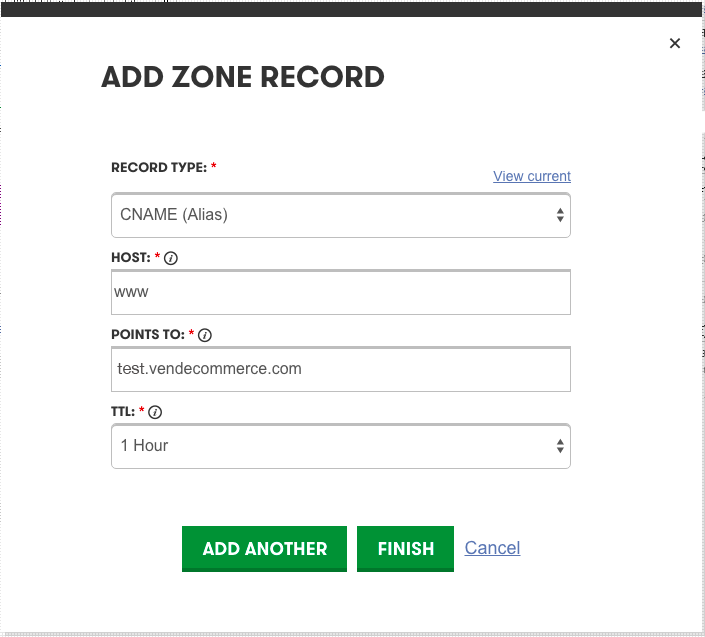 If you have a custom domain with GoDaddy and are looking to link it with Vend Ecommerce, these steps below will help you through the setup process. 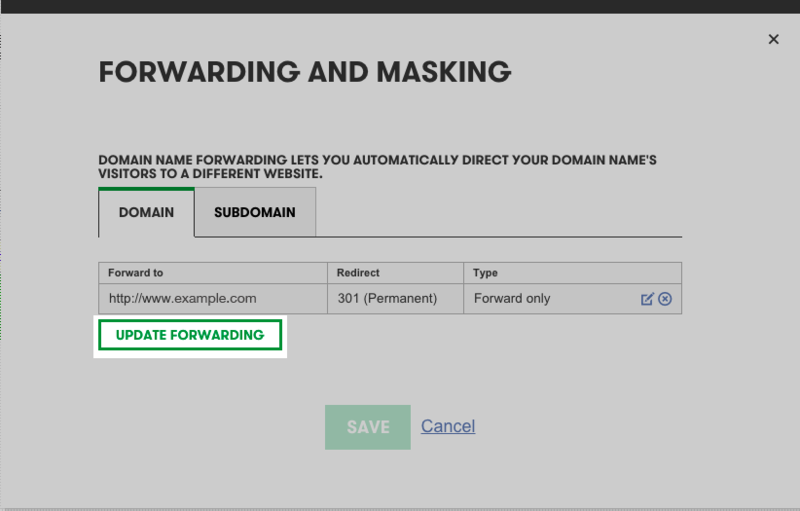 If you have already set up a CNAME record to link your www domain (e.g http://www.example.com) to Vend Ecommerce and would now like to setup a custom domain like http://example.com, then you will need to set up web forwarding. To do this click the link here . Important: Once you have completed these steps below, make sure you add your domain name to your Vend Ecommerce site. To learn how to do this, click here. 1. Login to your GoDaddy account, navigate to Domains and select Manage. 2. 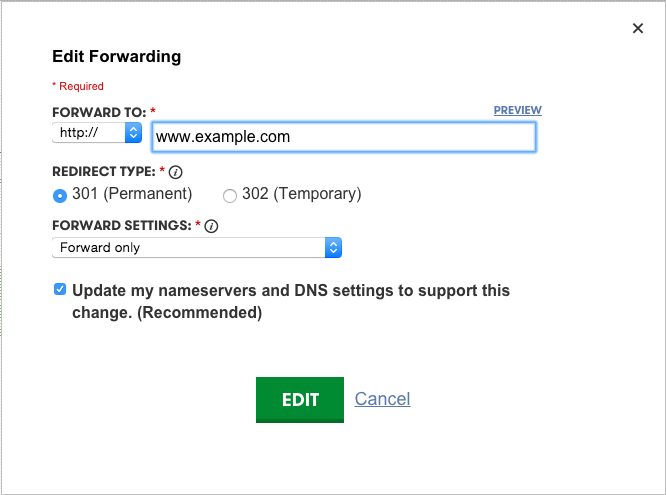 Next to your domain name, click on the arrow dropdown and select Manage DNS . 3. In the DNS Zone File section, click Add Record . 4. From the Record type list, select CNAME (Alias) . Note: to do this, you must have already setup a CNAME record for www domain. If you haven't done this yet, follow the steps above . 2. Next to your domain name, click on the arrow dropdown and select Forward Domain . 3. In here, select Update Forwarding . Redirect type: Under here, select 301 (Permanent). Forward settings: and choose Forward Only . It is important you select 'Forward Only' and not 'Forward with Masking'. Selecting 'Forward with Masking' will cause issues in your Ecommerce store such as the inability to add items to a cart. 5. To enable these changes, tick Update my DNS settings , select add and click Save or Edit . After more details? Head over to this GoDaddy article to learn more on how to forward your domain. Important: Once you have completed these steps above, make sure you add your domain name to your Vend Ecommerce site. To learn how to do this, click here.